In my mother-tongue, there's a word for it. I'm wondering what the English word is. I'm not looking for something like 'uncrispy' because it'll serve an all different purpose in this context. To avoid confusion of chips or fries, this is the picture of what I mean chips here. Soggy fits the bill I believe. Taken from the Oxford Dictionary of English and the Oxford Thesaurus of English. Soggy. This seems like what you're mainly describing. It's a change in the texture (how it feels) not so much how it tastes. If you dipped it in water, it'd become soggy. (Similarly, cereal left in milk too long becomes soggy). Stale. This is a change in both taste and texture, and is a change to the starch. The texture (for bread at least) is normally drier. Put some bread in the fridge for a few days, and it'll be stale. (Note this can be mostly reversed by heating). In bread at least, it occurs fastest around fridge temperatures. Rancid. This is the oil or fat oxidizing, so it can't happen without fat or oil. For things with a lot of oil, and once its well-progressed, you'll notice a very off odor that's normally described as "chemical" or even "paint thinner". This is also what, for example, limits the shelf life of whole wheat flour; the oils go rancid. This won't actually give you food poisoning, by the way. Spoiled. There is mold, bacteria, etc. growing on it. It's no longer safe to eat it. Also, especially in extreme cases, rotten. McVities defended its classification of Jaffa Cakes as cakes at a VAT tribunal in 1991, against the ruling that Jaffa Cakes were biscuits ... The product was assessed on the following criteria: ... The product hardens when stale, in the manner of a cake. The implication here is that while some things (e.g. cakes) harden when stale (presumably by losing moisture) while other things soften (e.g. biscuits) when stale (presumably by gaining moisture). If the chips got directly rained on, then that would be "soggy", but if you left the bag open on a humid day, causing them to get a bit damp, that would be "stale". Stale is also quite appropriate, as many others have pointed out: it is kind of a middle state where the food is no longer fresh, has lost some of its appeal and has degraded in some way, but is not yet harmful or inedible. Normally you would use this if the food has sat out for some extended period. Soggy is a more drastic state that implies an excess of moisture, to the point that it may actually drip water, or at least will make your fingers damp if you hold it. From experience, I believe the English word you are looking for is "stale". "Stale" seems to have the meaning "no longer pleasant to consume after being left in the open for too long". In which case, stale chips have lost their crispness, stale bread has become hard and dry, stale beer has lost its carbonation, stale coffee has oxidized and become sour and rancid. Mushy would be a good description. Merriam-Webster defines it as "soft and wet". Soggy could also work, but I would say that it applies only when the chips are significantly saturated with water. If the chips are merely no longer crispy due to exposure to low levels of moisture, mushy would be a better word. moisture diffused through the air or a solid substance or condensed on a surface, typically with detrimental or unpleasant effects. Given that it's come in contact with water, the word would not be "stale" which is when it becomes hard and dry but, as others have said, "soggy" or perhaps "sodden". A stale chip will snap audibly, a soggy chip will bend and tear. I am not an expert but for me the important part here is the feeling caused by air conditioned chips. Not the relativity of product but the feel of that product. Crispiness or crispness is the gustatory sensation of brittleness in the mouth, such that the food item shatters immediately upon mastication. 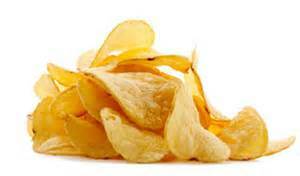 Crispiness differs from crunchiness in that a crunchy food continues to provide its material sensation after a few chews. On the other hand, a crispy food quickly loses the 'taut' equilibrium of its material, such as a tightly wrapped sausage. Cartilage /ˈkɑrtɨlɨdʒ/ is a flexible connective tissue found in many areas in the bodies of humans and other animals, including the joints between bones, the rib cage, the ear, the nose, the bronchial tubes and the intervertebral discs. It is not as hard and rigid as bone but is stiffer and less flexible than muscle. Not the answer you're looking for? Browse other questions tagged word-request word-usage or ask your own question. What is the difference between 'come' and 'go' when they use figuratively?